Video SEO is a powerful tool for your business, and here at Wistia we've got it fully covered. Learn more about Wistia and video SEO here. Video SEO is the practice of providing the metadata ("information") for your content to search engines to improve the richness of search results (i.e. “rich snippets”). This, in turn, drives more visits to your website. Wistia puts this video metadata on your page by injecting JSON-LD into your webpage’s header. As a part of your marketing efforts, following the proper metadata and general SEO conventions will help to improve your video’s presence on search engines. 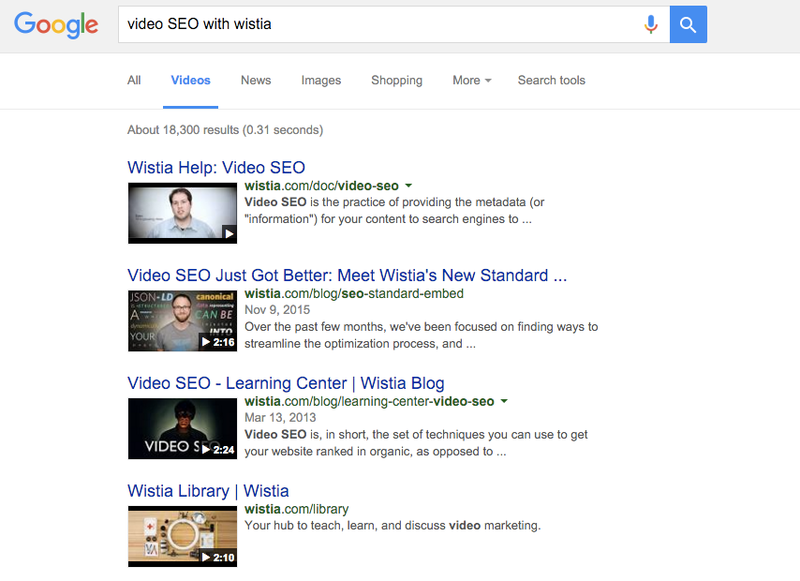 How can Wistia help with your video SEO? To get those sweet SEO benefits, all you’ll need to do is use the Standard embed code type on your website. Seriously, it’s that easy. Wistia’s SEO functionality automatically includes this metadata in your website to optimize your site for search engine indexing. Using recommended markup makes it easier for Google to discover and index your content. Follow these steps to make your video SEO game top notch. When search engines, like Google, crawl a page on your website, they can only identify and index a video properly if the page includes the right video markup. Google has extensive technical documentation about adding that markup (if you’re feeling like a light read), but you don’t need to worry about it! Wistia’s Standard embeds automatically put that markup on the page for you. Name: The title of your video, which you can set on the video’s page in your account. Description: A brief description of the video’s content. It’s important to write a description for each video, which you can do from the video’s page in your account. Transcripts: Your video’s transcript is automatically formatted as metadata to let search engines see that your video has captions. Thumbnail URL: The URL of the image search engines will use if they choose to display a preview of your video in the search results. Wistia’s got you covered on this front! Embed URL: A URL pointing to a player for a specific video. Duration: The length of your video. Upload Date: When the video was uploaded to Wistia. If you ever change that information in Wistia, it will automatically be updated on your website. Immediately! There’s no need to re-embed your video. You can use Google’s Structured Data Testing Tool to verify that Google is able to see your video and its metadata. If everything is working properly, you’ll see that Google finds a VideoObject on the page. For even more information on embedding, check out the embedding guide. Here’s an example for the video right on this page! If you’re feeling extra exploratory, you can check this out live by inspecting the <head> code of the current page (you’ll want to make sure you expand the <head element to see the <script type="application/ld+json"> script). The metadata for your video is pulled from the Wistia media page. So make sure you update the title and descriptions for all of your videos after upload. The title should be relevant for the video. Make sure it’s short and sweet. Don’t try too hard to make it wordy, or shove too many keywords into it. Just focus on appropriately naming the video for a viewer’s experience. Be as descriptive as possible, but again don’t go overboard with keywords. Make the description useful for viewers, not for bots. If your video has captions you can leverage that information to help your video get indexed with optimal context. If you want to see how you can add captions to your video, our Captions help page will show you how! How Can I See What My Metadata Will Look Like? Easy peasy! Our Embed & Share modal includes a dropdown menu that lets you look at all of that sweet SEO data. It’s easier than ever to see the same information that search engines are reading to help them rank your page. From the Video Actions menu, select Embed & Share. From the Inline Embed tab, scroll down. There you’ll see an option for SEO Metadata. Click the carrot next to the “Inject video metadata … ” option to see all of that metadata glory. The goal of SEO is to drive more traffic to your website. Optimizing your video content for search engines means that your pages will show up in video-specific search results, thus driving more traffic to your site. When a searcher clicks the video still in results, they will be taken to your website, which is a major advantage over YouTube SEO. We recommend keeping a close eye on your traffic during the SEO indexing process — see if you notice an uptick after your video content is indexed. From that baseline data, you can experiment with changes to improve incoming traffic. First, make sure you have related content on your page so that search engines have context surrounding the video. If you notice an increase in traffic from specific searches, add more content for those visitors. Second, the thing that drives folks to click on the video is the thumbnail! Choose a thumbnail that looks attractive for the topic at hand. Video SEO is tough but valuable. Customers have asked us lots of questions about using our video SEO tool for their video. We’ll attempt to compile them here. I thought only YouTube got indexed on Google search results? Should I have my video on both platforms? Google has continued to support an open market, indexing videos that follow their SEO guidelines, regardless of where they are hosted. If the most important metric for your video is views, YouTube is a great place for them. If your goal is to encourage a conversion event, like a sign-up, subscription, or a share, then you want to drive viewers to your site to watch your video. That is where video SEO can be a valuable tool. Can I use playlist embeds? At this time, we don’t provide SEO for the playlist player types. We made that decision because in our tests it seemed required for the Google bots to have direct access to the video on the page, and immediately accessible to the visitor, in order to reap the benefits of video on page rankings. It’s been several days, when can I expect to see my video ranked in SERPs? It can take up to 2 weeks for Google to index new content. Because Google can be a bit of a black box sometimes, it’s not possible to determine exactly when new content will be indexed for video results. In our experience, a waiting period of 10–15 days is not uncommon. If you have been waiting for a considerable amount of time, double-check the list of possibly bad practices below, to make sure your content doesn’t fall into one of the areas of content that Google doesn’t index reliably. What can prevent videos from being added to Google search results? There are a few practices that we have seen prevent indexing. Redirects are a tricky practice, and more often than not, they seem to cause failures. Google might not follow the redirect when crawling, or the redirects might be set up incorrectly. Disallowing content in the robots.txt file would result in everything appearing “successful,” but your content never appears in search results. Double-check that any “disallow” blocks in your robots.txt file do not point to content you want indexed. Putting video farther down the page can have a negative effect on the content. Where possible, make sure your videos are embedded at a good viewing size (at least 600px wide) and near the top of the page. More questions? Just want to talk about SEO? Give us a shout. We’ll be happy to talk more!